All opinions and content remain my own. This post contains affiliate links. 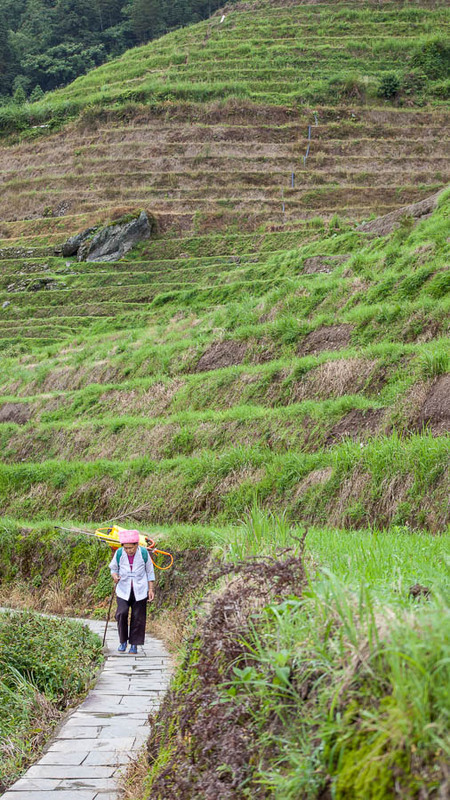 I was a sweaty mess when I arrived at the small village of Ping’an amongst the Longji Rice Terraces. When the time would come to depart, I would still be a sweaty mess but with an additional limp and a huge grin on my face; the next couple of days would be full of (mis)adventures and stunning scenery. The journey to Guilin from Shanghai had been long, 19-hours on a sleeper train, essentially the largest, 40+ bed dorm I had ever slept in, had left me slightly dazed and as our transfer deposited us at the park entrance, the final drive and 20-minute hike to get to the hotel seemed like a killer. A hot shower in the cutest accommodation I had ever seen though quickly had my travel buzz back in time for a massive feast with my G Adventures China tour squad. The view from my balcony was confirmation enough; Lonely Planet was on to something when they voted China as a Best In Travel destination for 2018. 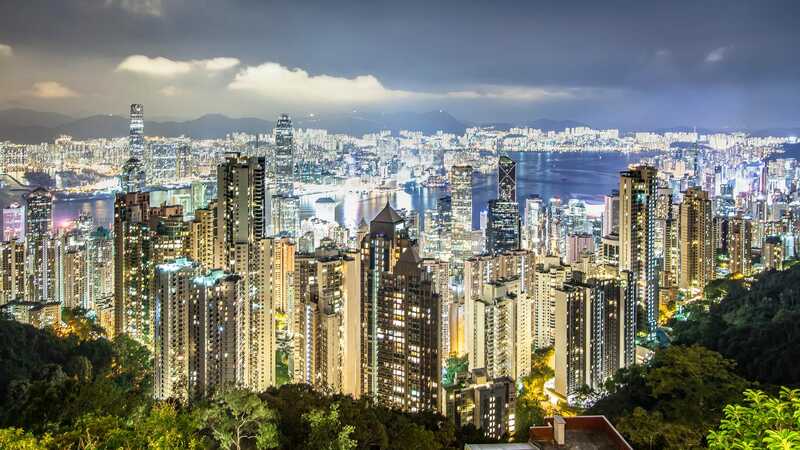 A 14-day Classic Beijing to Hong Kong Adventure with G Adventures is priced from £1,899 per person including all accommodation (allow US$475 for meals not included), a chief experience officer, and transportation in destination. Price does not include flights. For more information or to book, please visit www.gadventures.co.uk. 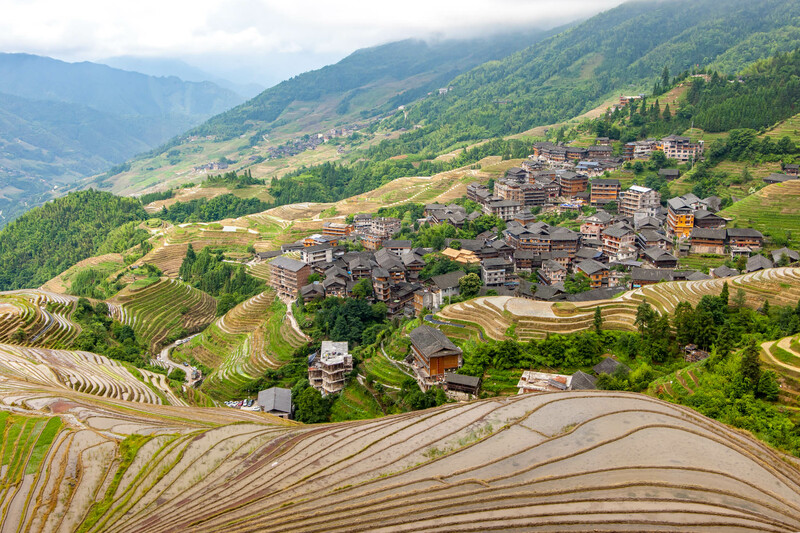 These incredible agricultural feats which tower up, down and across mountains are often referred to as Longji and provide a world-apart contrast to Shanghai where we had spent the previous few days. 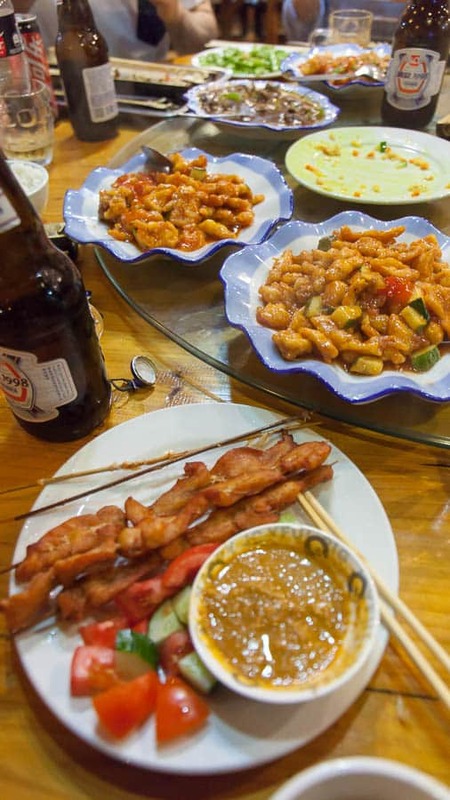 Situated in the south of China, in the Guangxi Province, their location is actually nearer to Hong Kong than Shanghai, making them ideal for a short China tour from the special administrative region if you don’t want to traverse China from the top down as I did. 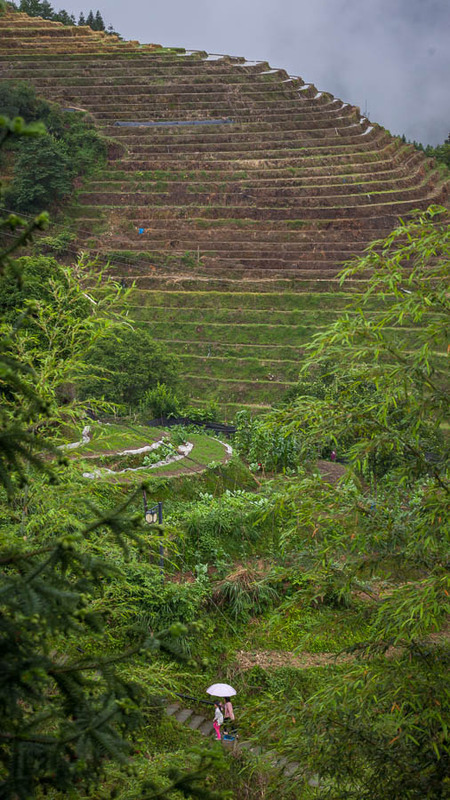 At an elevation of sometimes 2600-feet above Sea Level, although much lower in Ping’an, you are nearly in the clouds here and throughout the seasons, you can go from water-pumped terraces to layers of frost in winter. Our accommodation was one of the oldest in the village, and the views from the balcony were nothing short of breathtaking. The mix of traditional wood layout inside coupled with modern amenities and comfy beds though made this the standout accommodation of the tour. 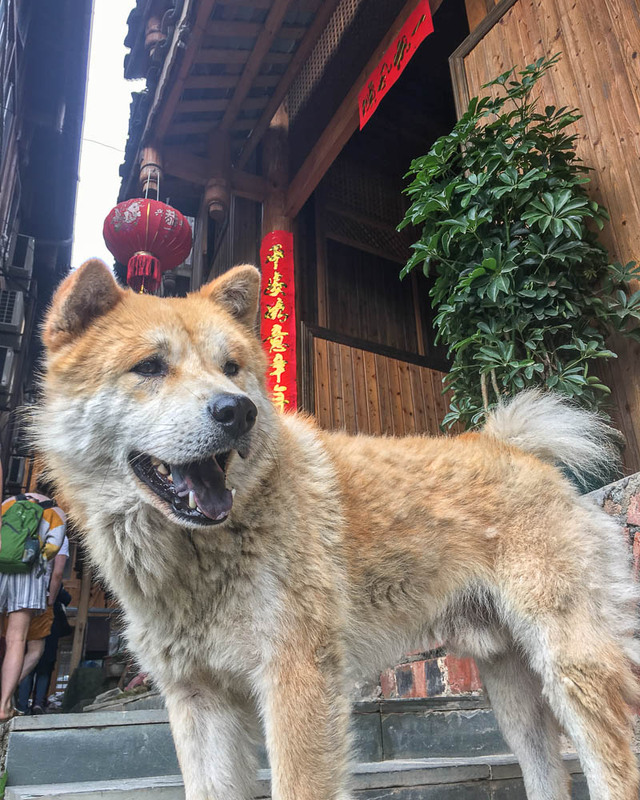 Dating back to the Yuan Dynasty in the 13th-century, the patchwork of terraces stitched together over the mountains breakaway for the small wooden houses, hotels and shops of Ping’an where locals work away cultivating the rice and now, entertaining tourist groups. With a population estimated at 200, this small village never felt over-run and while some day-trippers came in to hike, to see the clouds blowing in lit by moonlight was an experience I wouldn’t miss, so an overnight stay, or two as we experience on my G Adventures tour, is preferable. 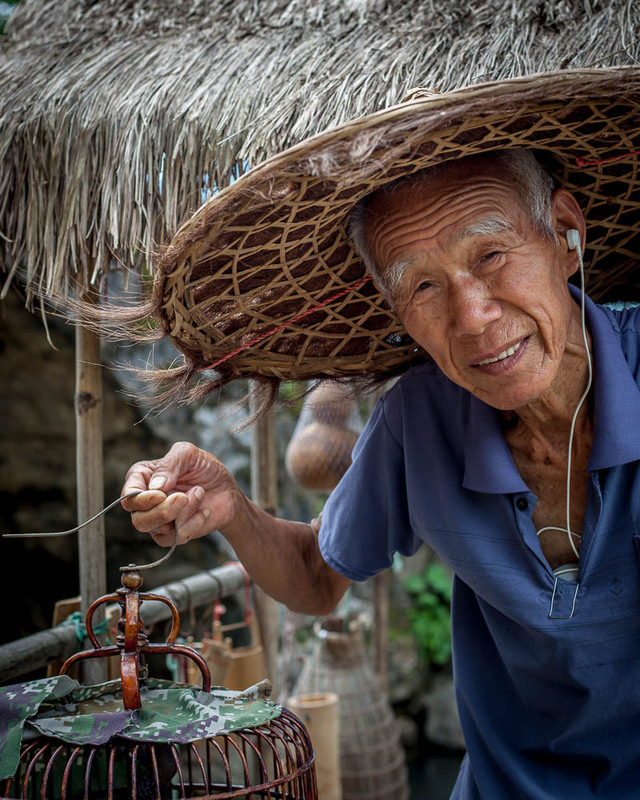 Throughout China, there are many minority communities, named so as they are not of the Han Ethnicity, the main group in China. 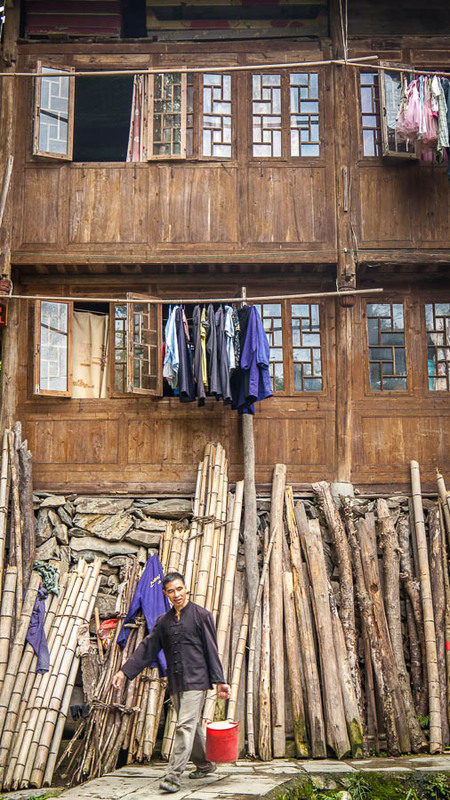 In Ping’an the main minority groups are Zhuang and a small population of Yao people. 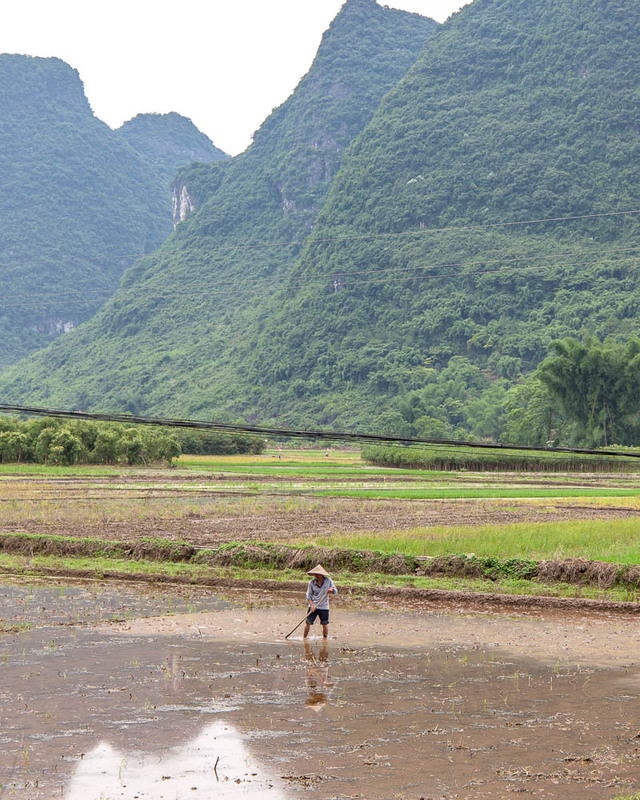 In the Guangxi region as a whole around 30% of the population identify as Zhuang, with Yao women being distinctive for their very long hair, often only cut once in their lifetime. 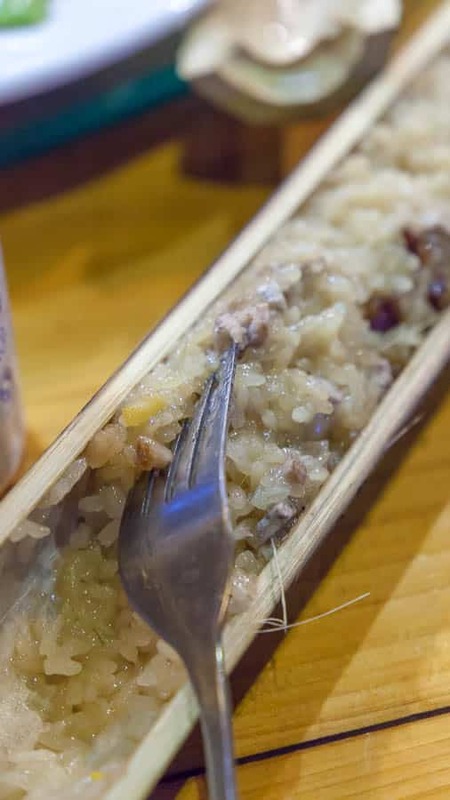 From the traditional Bamboo rice, grilled directly in the bamboo to the local medicines that I would soon be finding spraying into a multitude of cuts on my body, the pace of life is slower here and has a much more traditional feel to it. The hospitality I felt here, especially in our hotel, was by far the best in the country and I felt like a welcome guest to this magnificent part of the world. 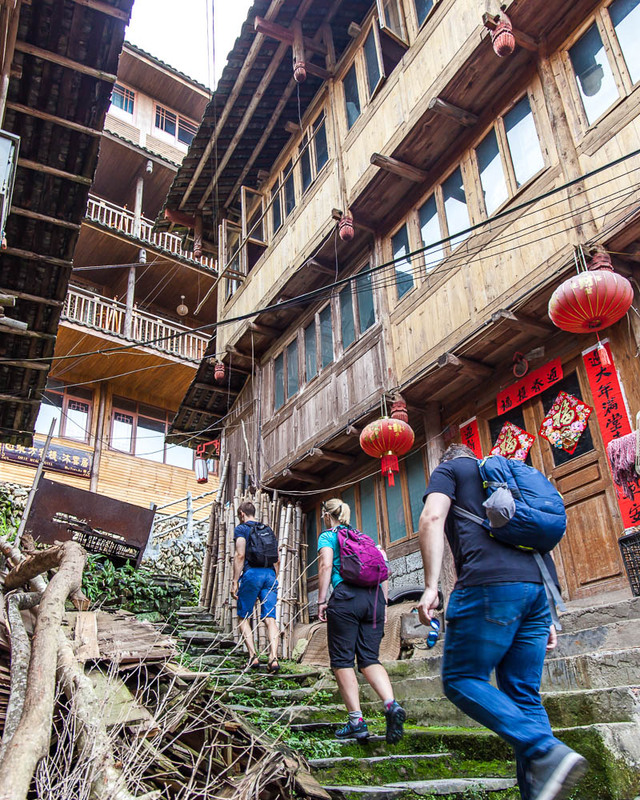 In Ping’an we were perfectly positioned to hike between the local villages and the location was close to some famed viewpoints. The Seven Stars around the Moon and Nine Dragons and Five Tigers are both named due to how the rice terraces look to the eye, mythical creatures and night skies in similarity. 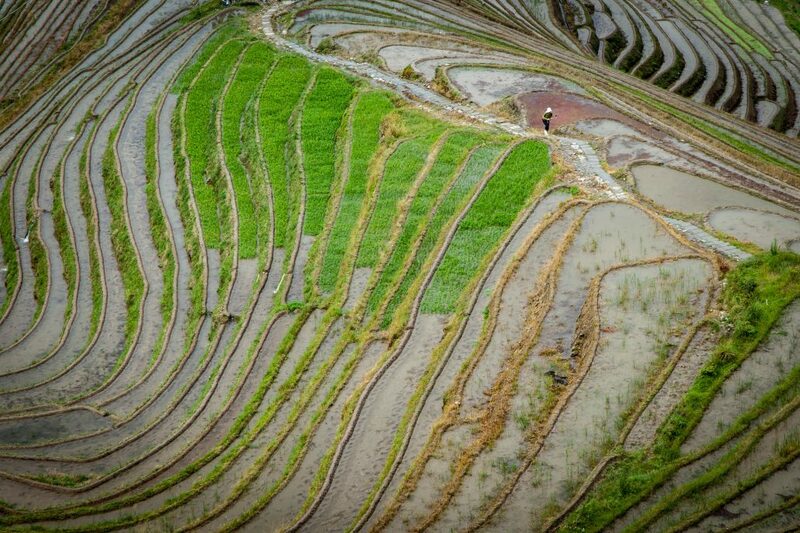 These almost aerial views of the terraces make for amazing photo opportunities, but the hikes which range from easy to tough, up and down stairs, paths and hardened mud provide plenty of opportunities to find farmers going about their work and see the terraces in action. Or, to see a farmer upside down and literally be the action in their terrace. In my bid to photograph the many butterflies that float gracefully around the fields I took a less than graceful fall down the terraces, rolling on to my back, spraining my ankle and becoming lodged in the terraces until a bemused farmer helped me out of his office and back on to the path. 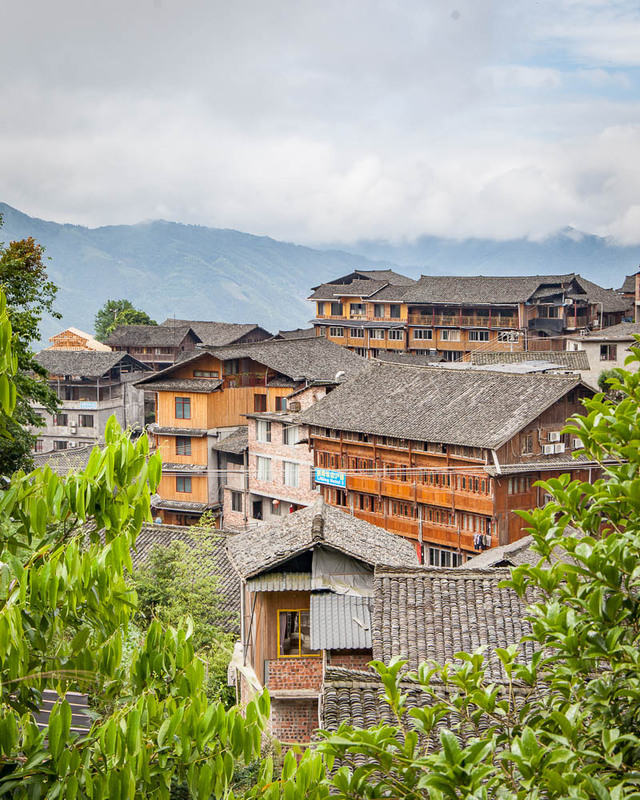 A swollen ankle brought an end to my hiking adventures in Longji, and while everyone else powered on, I sipped tea and marvelled at the million-dollar views from my hotel balcony until the time came to return to the train station and depart to Yangshuo. 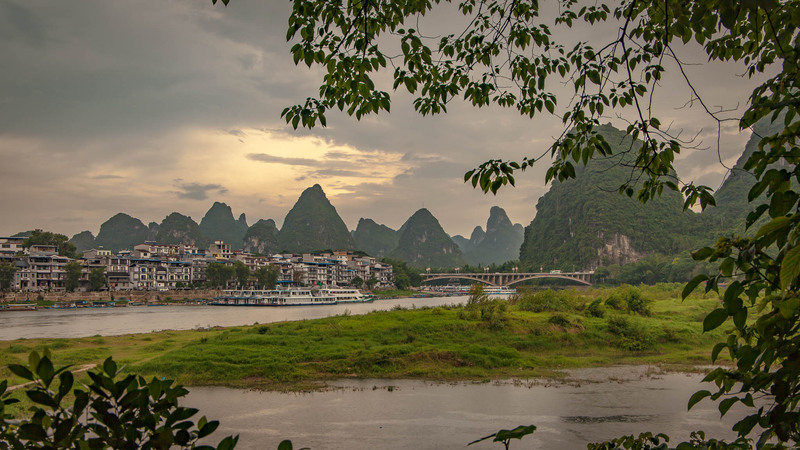 Yangshuo City has been growing as a backpacker hub for many years now, and this city surrounded by Karst Mountains, impressive soluble rock formations, seemed well versed in tourist touts and blaring bars. 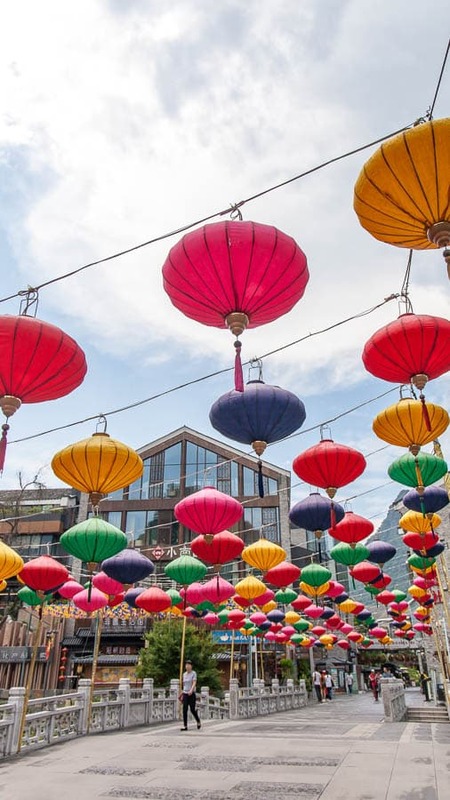 I’d expected to stumble into a small town with a laid-back vibe, but a quick walk around the main pedestrian street, West Street, with pumping music, intense street-sellers and all the flashing, twinkling and glaring lights quickly dashed my expectations. 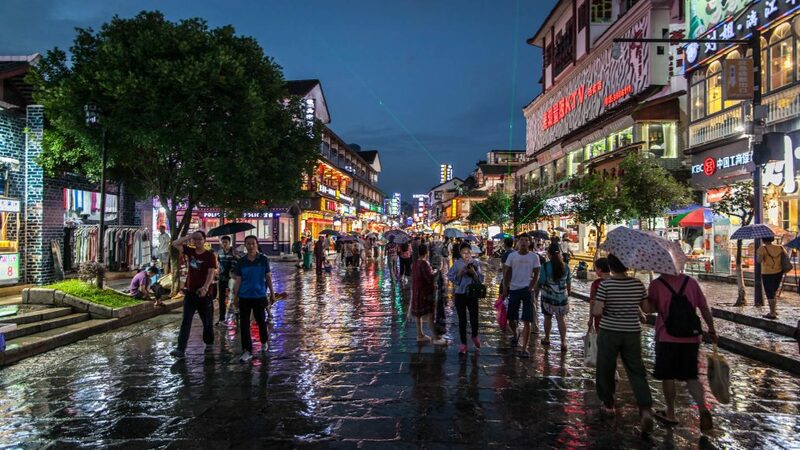 Throughout Yangshuo County, you can find much more traditional towns, but as a base to explore, Yangshuo City served its purpose. The real reason people come to this region though is to hike and explore the fantastic scenery that mother nature has provided. With most of my G Adventures tour group signed up for a bike and hike tour, my ankle, now doused in a mixture of Chinese herbal remedies, was after something more comfortable. 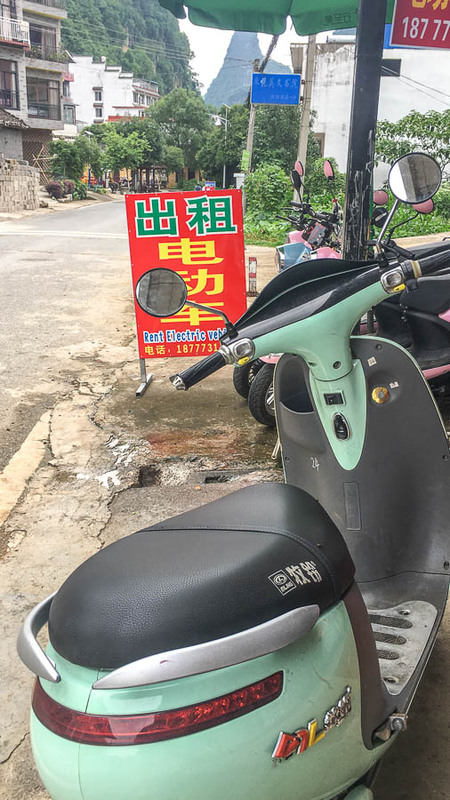 I rented an electric scooter for the day and headed out of the city limits towards the famous Li River. Within moments of going beyond the main road an utterly different vibe washed over me. The same Zen I had felt in Suzhou returned and as housing blocks turned into more mountains, more rivers and more fresh air I could see the genuine appeal of this region. I spent a blissful day driving nowhere in particular, stopping for green tea, chatting to the wooden raft owners between their clients and lifting my jaw off the ground from some of the lush-green views. It wasn’t how I wanted to spend my day in Yangshuo, to be honest, I’d actually really wanted to do a hike in Xingping my friend Alice had recommended on her website a few years ago but with my ankle out of action, a ground level view was impressive, if not exactly the photos I had wanted. 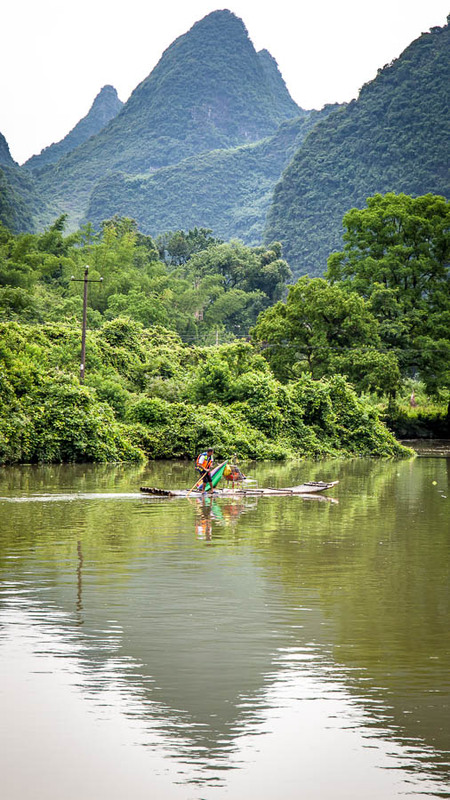 We regrouped towards the end of the day to take a river rafting cruise at one of the most famous points on the Li River, and I had expected it to be one of the small wooden rafts I had seen earlier but was actually a plastic, fake bamboo raft with an electric motor. While this might have covered more ground with speed and the views were beautiful, I’d highly recommend hunting out the more authentic wooden rafts that provide the soothing sounds of nature, not what essential sounded like a lawnmower. It was a little pricey, but the Liu San Jie Impression Light Show was something I am so glad I committed to and just a short walk or drive from the main city centre. 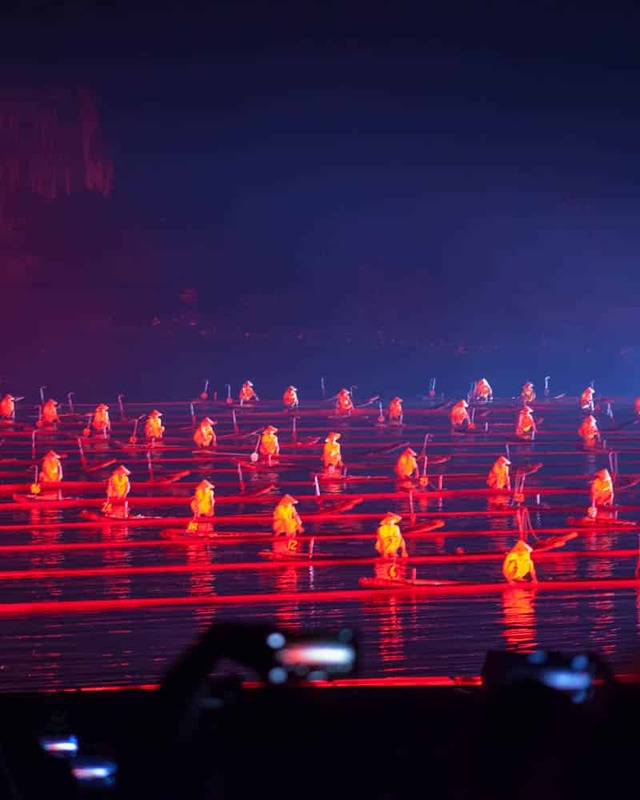 While it was hard to get good photos in the dark of night, this fantastic show took place on the water with the mountains as a backdrop and is directed by the same man who created the Beijing Olympics opening ceremony. The show was genius and the outside theatre setting a real treat. It was a bit odd as much of the audience started to depart, or chat, around halfway through the show but that seemed to be the norm around these parts. From Guilin Station, you can connect to Shenzen by bullet train and then take a metro onwards to the Hong Kong border. 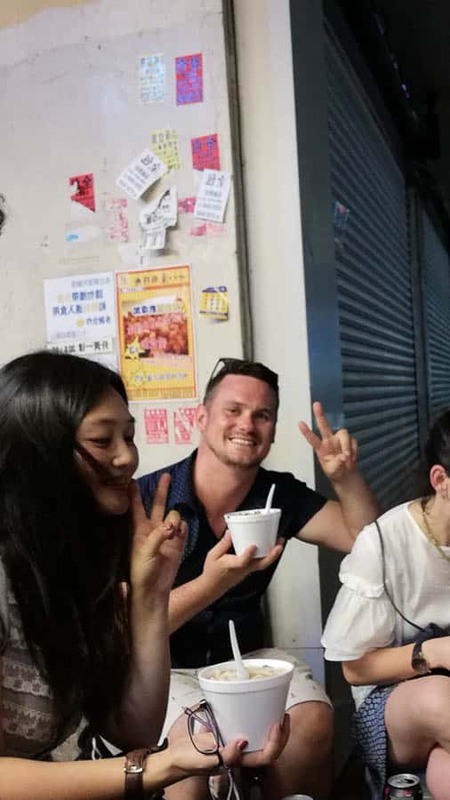 This is how we continued from Yangshou to Hong Kong on our tour, but G Adventures and other companies also offer reverse tours if you have your visa for mainland China. 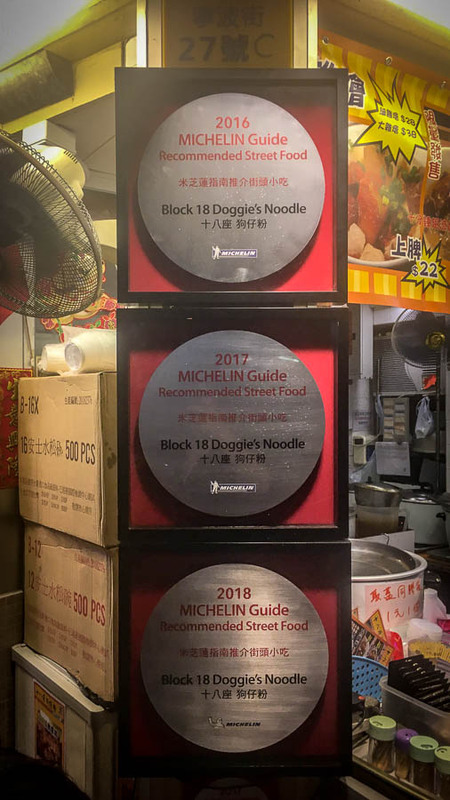 On this tour, we only had one night in Hong Kong, which was fine for me as I have visited this incredible city a couple of times before. 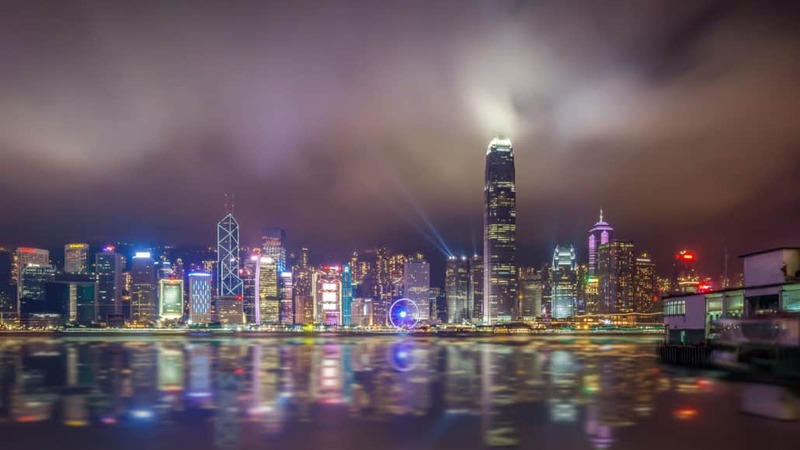 But, if it is your first visit make sure you have at least three days here so you can marvel at the skyline, eat amazing Michelin starred street food, hike around the islands discovering giant buddhas and soak up one of the most dynamic cities in the world. 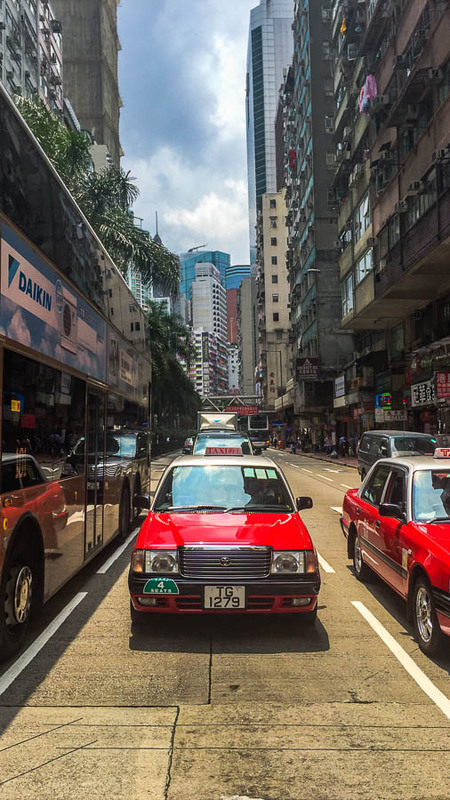 I’ve previously written down my top picks for a few days in Hong Kong, head over there for some more inspiration that won’t break the bank. 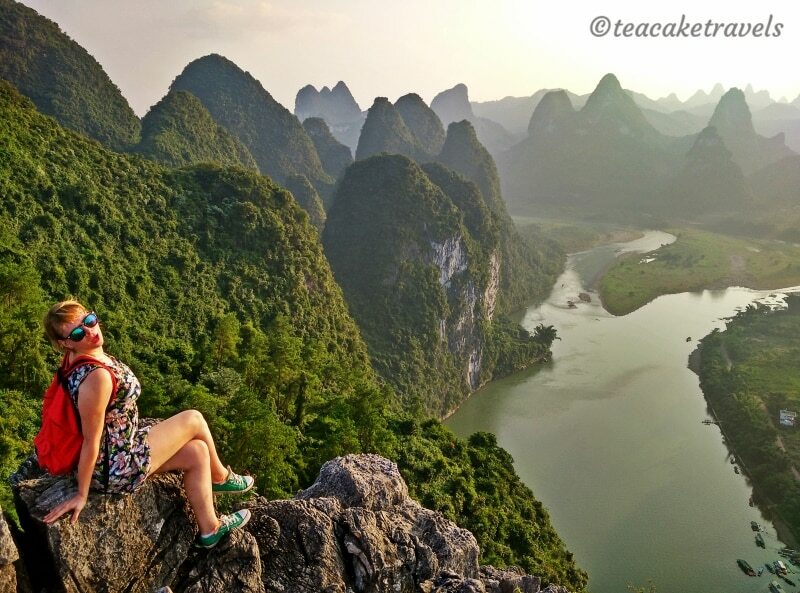 Read More: Should you join a tour in China? I was on assignment with Lonely Planet during my trip to China with ground support from G Adventures. 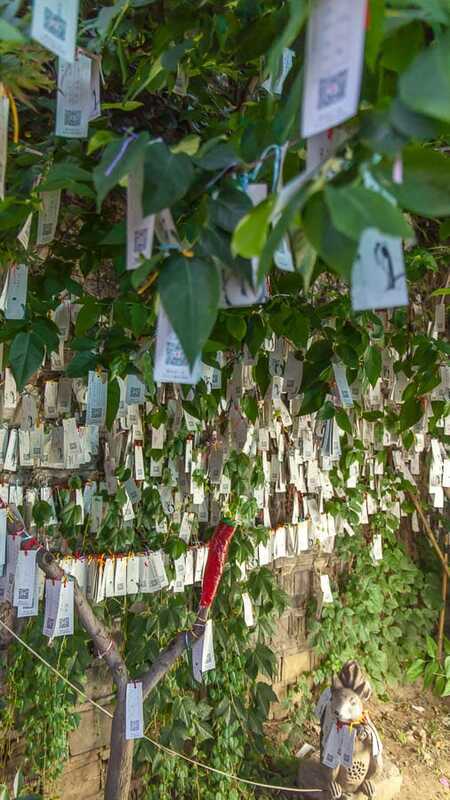 Bali: Beautiful or Beyond Repair? 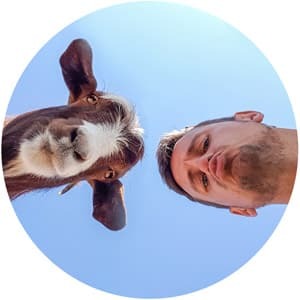 Very nice account of the rural landscapes. Simple and lucid words to explain the endemic ways of living of these villagers. I have also written a travelogue for the first time.